With minor variations this is the recipe I've been making for 40 years. It originally came from a home ec teacher and it is beyond awesome. The differences are, first, that I cream the softened butter with the sugar (not melted). I add 1 tsp. lemon juice with the vanilla, and use 1 tsp. each of baking soda and baking powder, and 1-3/4 c. flour. Finally, regardless of how many bananas are used it should equal 1 cup. 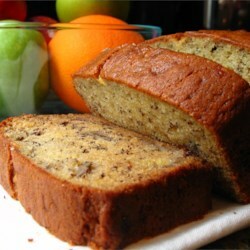 You will never find a better banana bread, and over the course of 40 years, I've never heard differently. Edited 8/17/09: My original 4/14/08 review should have indicated that I mash the bananas, not slice them.